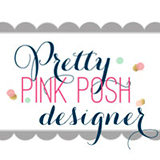 Hello crafty friends, welcome to the Pretty Pink Posh and Avery Elle Collaboration Blog Hop Day 2! You should have arrived from Avery Elle blog. My card today, I used the Avery Elle Stoked stamp set along with the PPP dies and sequins. To start, I created my own colourful background with the PPP Stitched Borders 2 die. I divided the A2 sized watercolour paper panel into five pieces using the PPP Stitched Border die, then inked each of them with Distress inks using mini ink blending tool: (from the top) Festive Berries, Mustard Seed, Mowed Lawn, Peacock Feathers, and Seedless Preserves. I put the pieces together using double-sided tape, then added water droplets. Next, I die cut the stitched fishtail banner from watercolour paper using the PPP Stitched Banner Duo die, stamped the drummer from the Avery Elle Stoked set on it in VersaFine Onyx Black. After colouring the drummer with Distress markers, I cut one of the drum images out using a craft knife, fill a circle with the PPP Silver Mini Star Confetti, then decorated around it with the PPP 4mm Clear Droplets for more fun! I mounted two panels as shown to white card base using dimensional foam tape, then added the speech bubble sentiments. Your next stop on the hop is super amazing Karolyn Loncon! We hope you have all enjoyed our inspirational blog hop! Thank you so much for stopping by. Have a wonderful day!! Hello crafty friends! I’m back with my homework cards from Day 5 at Online Card Class Stretch Your Dies. I was inspired by Dawn of WPlus9. Dawn’s masking stamped image technique is so fabulous and it really knocked my socks off!! Today’s cards are one of my favourite and I’d absolutely recommend the Class!! Hello crafty friends, happy Wednesday! I’m popping in to share my cards for entering AEI♥U Challenge! The theme of this month is ‘Stripes!’ and wow! I am luckily -and so happily- have Avery Elle Brushed Stamp set. There is an awesome brushed stripe in the set and it means I can create my own stripe pattern for my cards!! For my card today, 1)I stamped the stripes on the white panel using Brilliance Pigment Ink Galaxy Gold. 2)I stamped sentiment and ink splatters using VersaFine Pigment Ink Onyx Black and clear heat embossed. I then fussy cut them. 3)I stamped gem from Avery Elle Many Thanks stamp set with black pigment ink and clear heat embossed and then coloured gem with yellow watercolour and spatter panel with Distress ink Black Soot. 4)I affixed stamped images with dimensional foam tape. easy-peasy, right?! It was the same idea with my first card but, made colourful stripes! -I used Brilliance Pigment Ink Rocket Red, Pearlescent Lavender and Colorbox Chalk Ink Canary, Robin’s Egg. That’s it for today. Thank you so much for stopping by. Have a wonderful day!! Woot Woot! Thank you so much Avery Elle!! Did you have a wonderful weekend? Honestly I didn’t… it was toooo~ hot to walk outside in Sydney yesterday Arrrgh!!! But, I tried to keep my holiday mood and made winter scene Christmas cards lol! And today I am playing along in AEI♥U Challenge #18 Holidays! YAY!! I coloured two little ladies using Copic markers and sponged the bottom side of the white cardstock & panel in Distress ink Tumbled Glass using blending tool. Gold, silver and red glittery stars are the very things for Christmas! Woo hoo! I am so in love with these sweeties.